Both Grampa Davis and Grampa Mueller had tool sheds full of stuff–coffee cans loaded to the top with old nuts and bolts, rusty bent nails, pieces of wire, lumber scraps. The grandmothers both had cardboard boxes of fabric leftover from sewing projects, salvaged buttons, tag ends of yarn, and saved flower pots. When I was small, my little hands loved to sort through this stuff just to see what was there. Sometimes, the potential in the material gave me an idea for a creative project. If I asked permission, these wonderful grandparents would almost always let me fabricate whatever I wanted. The reason to save things was that you never knew when you might need something. It was a long way to town on gravel roads, and those old nuts and bolts were still serviceable. I thought of this the other day at work while I was scrounging around for plywood backing for signs. A new sheet of plywood costs $25 or $30, which the federal government can probably afford. But I’ve seen my boss crunching the budget numbers, and it’s a real pain to jump through the purchasing hoops. Besides, I’ve got a plywood stash ratholed away. I was able to find what I needed, cut it to size, and slap on some fresh brown paint. No cash outlay, no trip to the lumberyard, just a little of my time. Is it “green” to repurpose stuff, get some more use out of it before it heads to the landfill or rots away in the forest? Or is it just cheap and parsimonious? Some of each, I think. Today at home I am creating Christmas gifts. Because I am my grandparents’ grandchild, I’m using materials I have on hand. 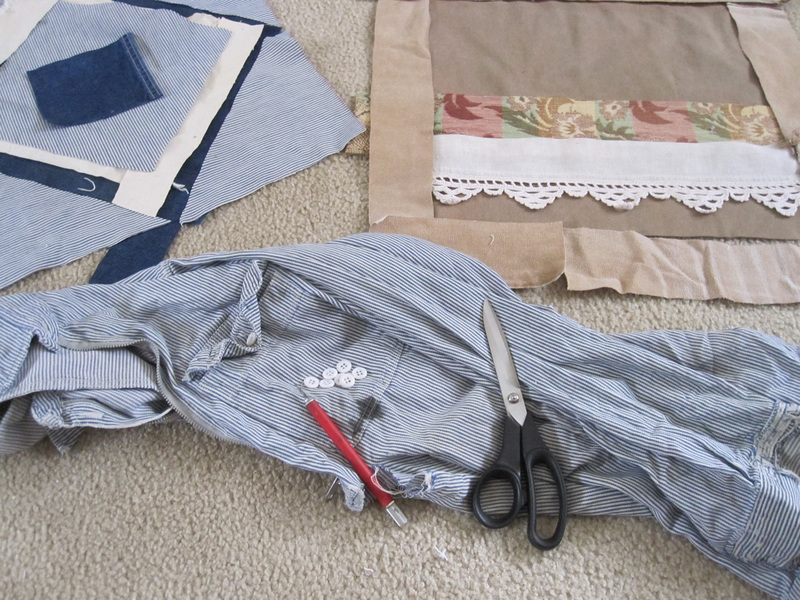 Parts of an old hickory shirt and overalls will become a pillow top. What’s left of the shirt is cut up into soft cotton rags which I will take to work to use for chainsaw cleaning and application of citrus solvent to handsaw blades. I cut the buttons off for my own button can. A pair of elk brown Carhartts were worn nearly to rags on the trail, but the bottom of the legs are as soft as buckskin and intact. That fabric will make a nice edge for another pillow. If I were really thrifty, I would chop up the leftover cotton bits for the compost. But I feel lavish, so a handful of old cloth goes in the trash. Gramma Mueller would have burned it in the woodstove and gotten some heat out of it. I grew up in prosperous times, so my parents bought new more than their parents did. The roads were paved and it was easier and faster to get to town. No need to be a packrat, especially in a mobile society. Who wants to move coffee cans of hardware to a new garage? Stores are full of merchandise, enough choices and selection to boggle the mind. I don’t know that more stuff makes the world a better place, especially when I start following the thread of transportation, manufacturing, extraction of raw materials, labor practices and so on. The world feels a lot smaller and more fragile than it did when I was a child. It can’t hurt a thing to practice thrift, mindfulness and creativity. I feel connected to my grandparents and the values they lived every day. Grateful to have enough sheltered space to store some of my packrat treasures. Making things is fun–the magical experience of transforming one thing into another fascinates me as much as it ever has. I was born, grew up in and live today in a way & place that was confusing, because though subjected to abject poverty, setting was in the midst of natural granduer that I gloried in… it made me feel absurdly privileged! Northern Appalacia.. the Maine Longfellow range: where grandfathers had cold attics full of tin cans, laboriously washed.. saved for starting garden seedlings.. boxes of cloth snippets from clothes making became quilt tops… I’m less like them, but enough so that if the world crashed, I could probably make it, because I remember & honor the old ways.